Didn't we just put away the Christmas decorations? How can it be time for the NIADA Show--but it is. February 18-19 at the Forest Hills Lodge in Rockford Illinois. It is the 52nd annual show--and we are doing it for the second year. So this is a week of unpacking inventory, setting up vignettes, making small repairs and testing lamps and making price tags. We will be taking a wonderful decorative mix. Our booth will focus on good, affordable vintage and antique decorative items that are "room ready." Some fabulous paintings and lamps and lots of quirky one of a kind items. This is a medium sized show--with good quality dealers and is really well run. If you are looking for furniture or smalls--this show is for you. Don't think postcards and Roseville pottery. This collection of dealers creates good displays--it is a terrific show. Lately I am obsessed by paintings of houses. Something about vintage house paintings gets my imagination rolling. Beyond the obvious of whose house is it-- why was this painted? A family member? 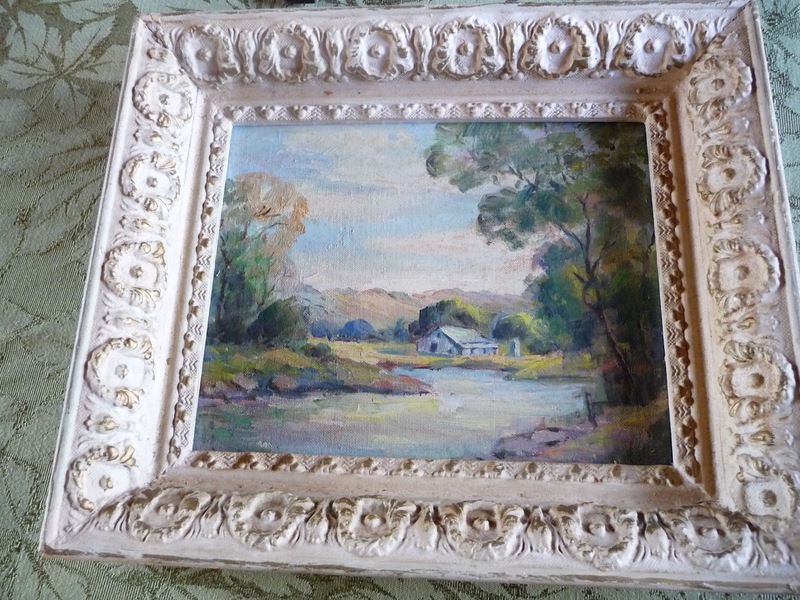 An itinerant painter who came calling one day and painted it for $1.00? Where has it been hanging for so long? What was the journey it took to get to my workroom and now be part of a blog post? This was someone's HOME it isn't just a house. If anything makes me remember that we are just caretakers of "stuff" and someday everything I am living with today will be in someone else's hands--it is looking at long ago painted house paintings. These are two house paintings that I recently acquired--and they will be coming with us to the NIADA show this weekend. On the reverse of the first one--it is signed by the painter--Estella G*****, from Ottawa Illinois. It is a colorful oil in a drop dead gorgeous cream and gold gesso frame. 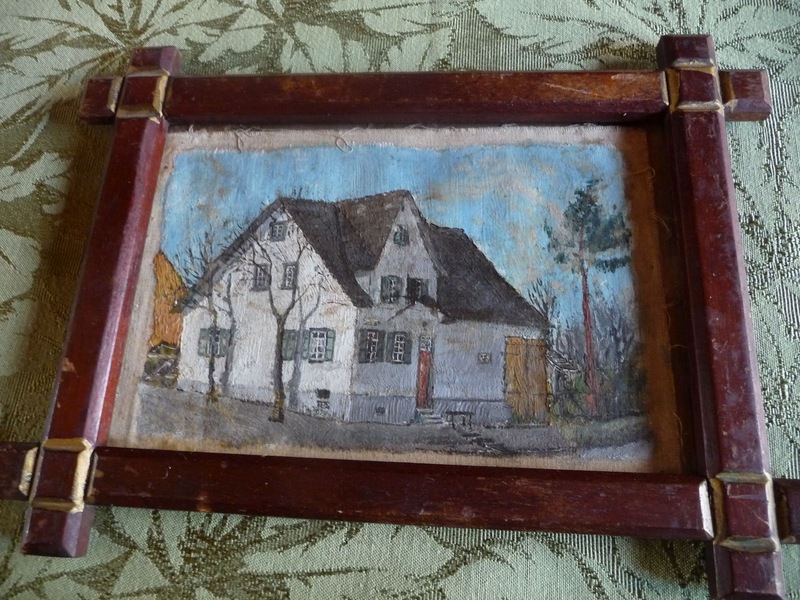 The second one is a well done oil on a small piece of rough canvas--original frame--and backed by an old advertising board. This weekend these paintings will hopefully move on to new owners who will love them. And the journey continues.